Route. 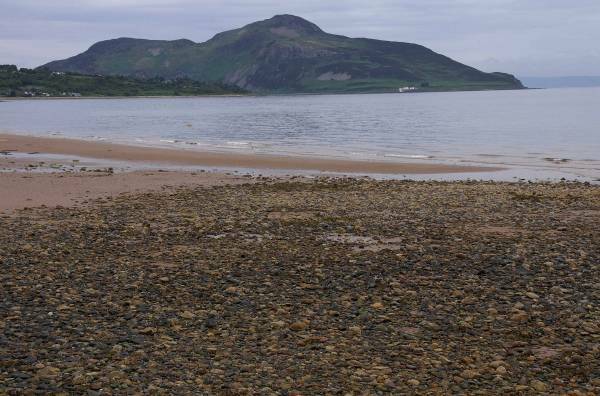 Whiting Bay - Glenashdale Woods - Iron Age Fort - Glenashdale Falls - Whiting Bay. Notes. The 140ft cascade of Glenashdale Falls was to be our destination for today, if we ever get a break in the weather, we also intended to visit the Giants Graves, chambered cairns from 5,000 years ago, the Forestry Commission Scotland had other ideas.The Coffee Pot restaurant in Whiting Bay marked the start of our journey,we followed the metalled road to the right of the Coffee Pot to quickly reach dense pine forest, by forest track and way marked paths we quickly had our first glimpse of the falls, climbing higher we passed the sad remains of an Iron Age Hill Fort before crossing Glenashdale Burn above the falls, a short descent brought us to a splendid viewing platform, descending the south bank found us hunting for the path to the Giants Graves, it wasn't hard to find, the sign read path closed, danger, sod it we followed it regardless, to be confronted by a forest of felled trees, onwards and upwards we went until the going got to dangerous to continue, we almost made it but not quite, retracing our steps was just as dangerous, but we soon emerged unscathed at Ashdale Bridge. Holy Island seen from near the Coffee Pot at the start of the walk. 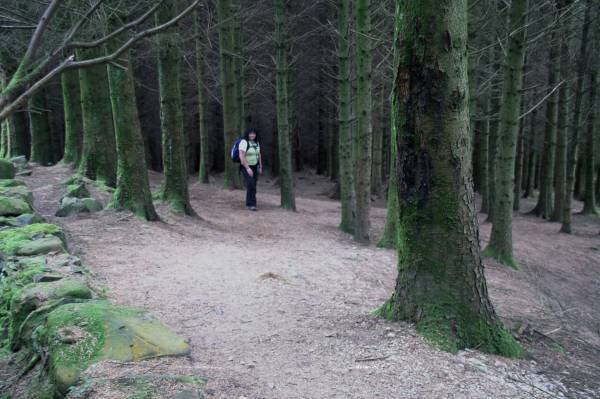 Sue hunts for the path in the dense pine forest of Glenashdale Woods. 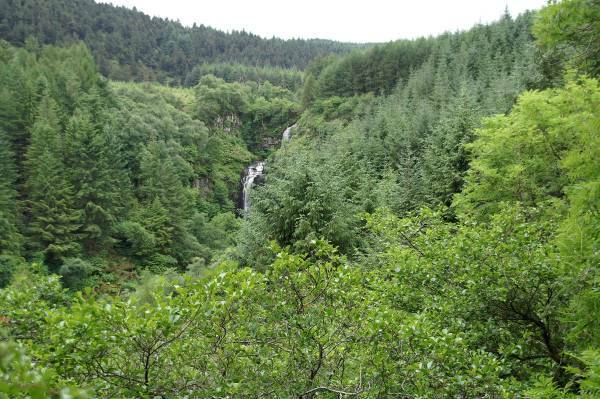 As we emerged from pine forest our first view of Glenashdale Falls. 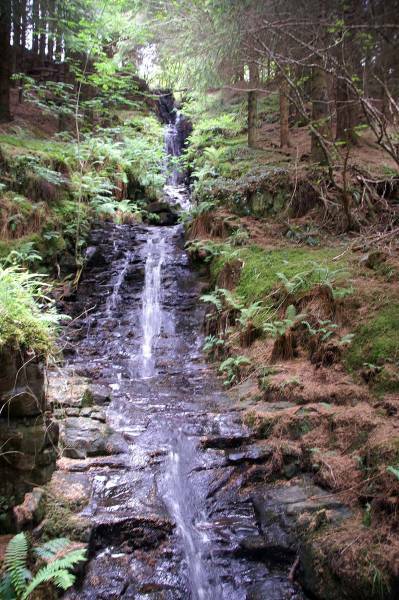 A small burn tumbling through the woods near the Iron Age Fort. 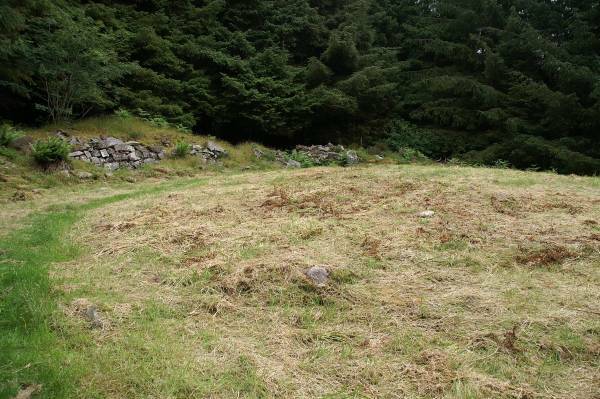 The sad remains of an Iron Age Hill Fort, it's easy to see why you would build a fort here, in the days before pine plantations this small hill would have commanded fine views down Glenashdale, it would have been very easy to defend. 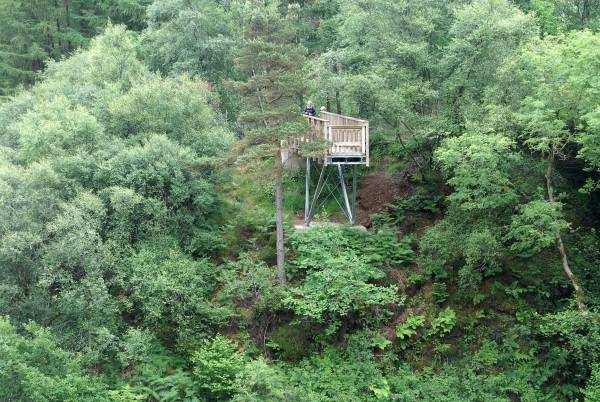 A fine viewing platform seen across Glenashdale, the falls aren't visible from where I'm standing. 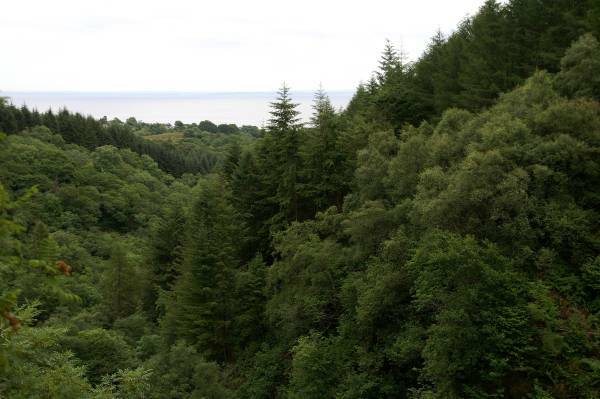 If the weather had been better the views from here, across the Firth of Clyde would have been quite spectacular. 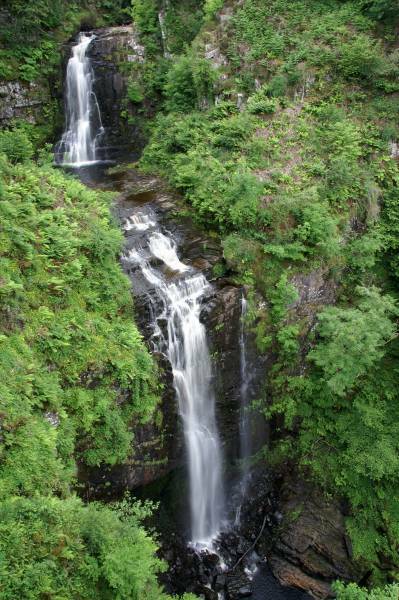 The 140ft broken cascade of Glenashdale Falls. 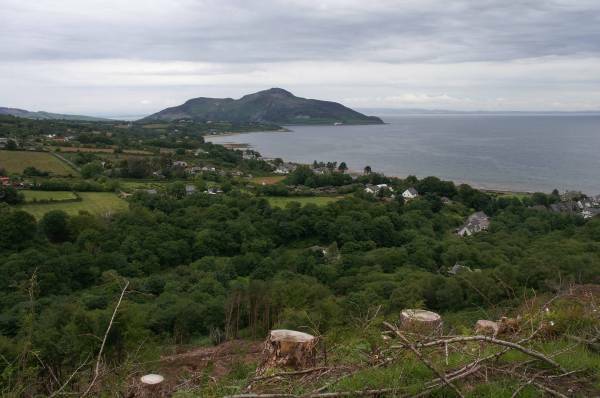 This was our turning point, the path to the Giants Graves had become to dangerous, but the climb was not in vane, with the trees gone the view across Whiting Bay to Holy Island was quite spectacular.